Lupinacci: "I want to thank all the students from our local schools for attending the event yesterday." 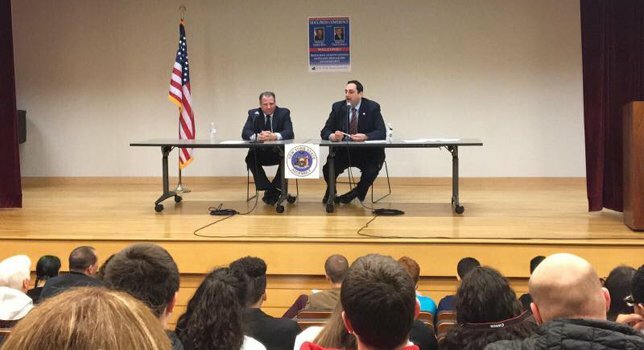 (Left to Right): Assemblymen Andrew Raia and Chad A. Lupinacci at yesterday’s mock press conference hosted by South Huntington Public Library. South Huntington, NY - May 1, 2017 - Recently, Assemblymen Chad A. Lupinacci (R,C,I,Ref-South Huntington) and Andrew Raia (R,C,I,Ref-East Northport) held a mock press conference at the South Huntington Public Library. This press conference gave over 100 students from several Suffolk County high schools the opportunity to experience what official press conferences entail. Many of the topics discussed dealt with issues and legislation that were included in this year’s state budget, such as higher education, K-12 education and the heroin and opioid epidemic. The students who attended the event were from Brennen High School, Brentwood High School, Deer Park High School, North Babylon High School, and Walt Whitman High School. Subject: LongIsland.com - Your Name sent you Article details of "Assemblyman Lupinacci Welcomes Local Students To Mock Press Conference"